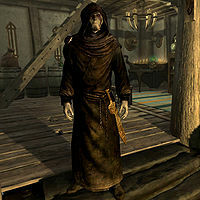 Drelas is a Dunmer elemental mage who lives alone in his cottage south of Morthal. He is not overly prone to conversation; if you decide to enter his cottage, he will attack with powerful magic and a random leveled dagger (up to glass quality). He wears a random magical robe and a pair of boots, and keeps an assortment of random magical items with him such as spell tomes and alchemical ingredients. His house contains an alchemy lab and arcane enchanter, as well as a number of alchemical ingredients scattered about. Due to his high aggression, if the fighting spills outside he will kill his own chickens.